A doctor was “scared and unable to move” after a drunken woman punched her in the head outside a Wigan railway station, a court heard. Even attacker Angela O’Rourke admitted later that her victim Dr Urjitha Rajogopalan, who had alighted from a taxi and was rushing to catch a train, was “blameless” and has apologised to her. Wigan magistrates heard O’Rourke, 35, started drinking when a friend she had arranged to meet in Wigan did not turn up. She was “quite inebriated” when she came across a taxi pulling up at Wigan Wallgate to drop off Dr Rajogopalan. Steve Woodman, prosecuting, said O’Rourke started banging on the bonnet of the vehicle, which reversed and then drove towards her. She banged on the car harder and shouted abuse, he said. Dr Rajogopalan, who needed to catch a train, paid the driver but O’Rourke shouted abuse at her as she left the vehicle. O’Rourke then ran towards her and punched her in the back of the head, the court heard. The doctor was “scared and frozen in fear, unable to move” after being hit. Two women nearby checked on her and took a picture of O’Rourke, who was still shouting abuse. The incident was reported to British Transport Police and O’Rourke was arrested a month later after the photograph was circulated on social media. Mr Woodman said she accepted carrying out the assault when interviewed, apologised and said the victim was “blameless”. O’Rourke, of Rose Crescent, Skelmersdale, pleaded guilty to assault by beating. Defending, David Lacide said CCTV footage showed the taxi driving towards O’Rourke and she nearly went on to the bonnet. Police said she could make a formal complaint about the way it was bring driven, he said. 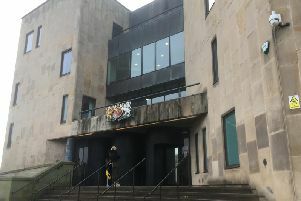 He said she had been in a difficult relationship and was victim to “many assaults”, leading to her getting an injunction against the father of her child. Her mental health deteriorated and she suffered a breakdown in late 2018, with her son going to live with his paternal grandparents. He imposed a conditional discharge for 18 months. She was also told to pay £100 compensation, £85 costs and £20 victim surcharge.